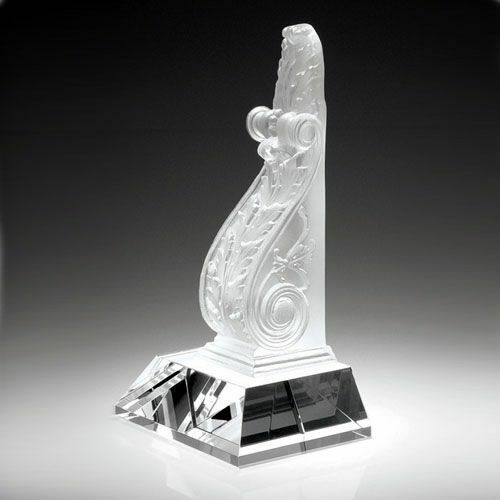 This magnificent award is part of Prism Crystal's Elite Collection and features a bookend with intricate decoration set on a clear optical crystal plinth. The bookend is made in pâte de verre, a method using 24% lead crystal paste and requiring hours of detailed work by skilled craftspeople (see Product Description below for more information about pâte de verre). Standing 9 3/8in tall these highly distinctive awards are perfect to reward and recognise corporate or academic achievement. They can be engraved on the base and are offered with low cost engraving. Size: H 9 3/8in x W 5 1/4in x D 3 3/4in.